According to a new report titled ‘Wood Activated Carbon Market: Global Industry Analysis, Size, Share, Growth, Trends, and Forecast, 2018–2026,’ published by Transparency Market Research (TMR), the global wood activated carbon market was valued at US$ 785.80 Mn in 2017 and is anticipated to expand at a CAGR of 8.1% from 2018 to 2026. The global wood activated carbon market is driven by stringent regulations on mercury emission from power plants. Asia Pacific accounts for a major share of the global wood activated carbon market, due to rigid government regulations regarding atmospheric emission of hazardous substances, particulate matter, and greenhouse gases in various industries in the region. Mercury is a toxic and corrosive material that is present in small amount in various gas and liquid streams. Power generation sources emit more than 70% of mercury in the air across the globe. Thermal and coal-fired power plants are key sources responsible for producing these hazardous gases. Wood activated carbon adsorption process is a suitable processes for removing mercury. It is an excellent carrier for various impregnates, as it physically reacts with the mercury and holds it within the adsorbent particles. Increase in governmental pressure to maintain the air quality and reduce mercury level is anticipated to boost the demand for wood activated carbon in the near future. Developed and developing economies, such as the U.S. and China, are implementing control strategies to reduce mercury emissions. For instance, the U.S. is estimated to reduce mercury emission to 18.2 tons by 2020, while China is likely to reduce emission by 77.5 tons by 2020. Control targets set by these countries and characteristic properties, such as high surface area, fine particle size, and open pore structure, are expected to boost the demand for wood activated carbon in the removal process of flue gas contaminants during the forecast period. Activated carbon injection system is an effective technology which is gaining momentum in controlling gaseous emissions. This technology is anticipated to create significant opportunities for wood activated carbon manufacturers in the near future. In 2011, Standard Carbon LLC developed Stratocarb, a powdered activated carbon (PAC) manufactured from wood, especially for flue gas mercury removal applications. 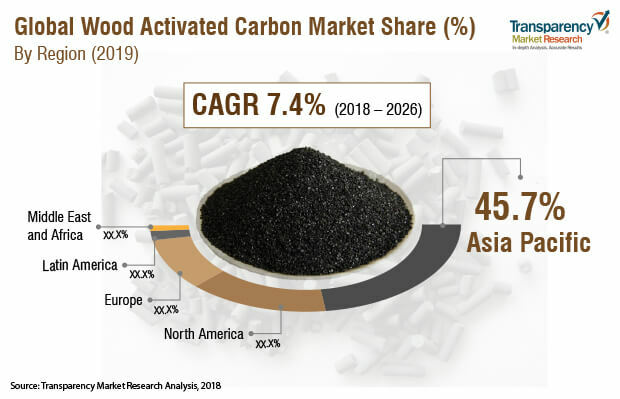 Economic growth in countries in Asia Pacific and Middle East & Africa is creating lucrative opportunities for wood activated carbon manufacturers. The market in developing nations is expanding due to significant expansion of chemical, automotive, and pharmaceutical industries. Thus, manufacturers are shifting their focus away from developed economies. Water pollution has become a major global concern, as industrial effluents, sewage waste, and agrochemicals are being discharged into water bodies. Advancements in chemical processing industries and drinking water technologies, especially in India, Brazil, GCC, and China, is likely to boost the demand for wood activated carbon. Wood activated carbon is a highly effective water filtration media that is used to remove contaminants from industrial and municipal wastewater and groundwater. Usage of new technologies, such as plasma processing for surface enhancement of wood activated carbon, is gaining momentum. Surface medication with this technology entails exposure of wood activated carbon to plasma under vacuum, thus altering its textural properties. Regeneration of wood activated carbon from industrial effluents is another technology that is likely to reduce the dependency on virgin raw material sources in the next few years. These factors are expected to create lucrative opportunities to manufacturers in the near future. The global wood activated carbon market is prone to fluctuations in prices of raw materials such as saw dust, wood pellets, wood flour, and other pretreatment chemicals such as calcium chloride. Constant volatility in prices of raw materials is adversely affecting the wood activated carbon market. Additionally, these raw materials are consumed in other end-user industries, such as fuel generation, wood pulp, and synthetic resins, thereby affecting the supply and demand of raw materials and overall production of wood activated carbon. Stiff competition from substitutes, such as coconut shell, and implementation of stringent regulations regarding deforestation are key factors that are estimated to restrain the market during the forecast period. The global wood activated carbon market has been segmented based on application and region. Based on application, the market can be divided into gas adsorption, removal of impurities, decolorization, and others. Removal of impurities accounts for a dominant share of the market. Rise in demand for water treatment, which includes drinking water treatment, groundwater rehabilitation, treatment of service water, and wastewater treatment, to remove contaminants is expected to propel the demand for wood activated carbon during the forecast period. In terms of region, Asia Pacific accounted for a major share of the global wood activated carbon market in 2017. China, India, and ASEAN are expected to create lucrative opportunities for manufacturers of wood activated carbon in the near future due to rapid industrialization and economic growth. Increase in the number of water treatment plants installed to remove organic chemicals in water and improve the taste and odor of potable water is boosting the market in Asia Pacific. Implementation of stringent regulations on mercury emission, by Environmental Protection Agency, and rise in demand for efficient canisters for the automotive industry, especially in the U.S. and Germany, are propelling the demand for wood activated carbon in North America and Europe. The market in Latin America and Middle East & Africa is expanding at a sluggish pace; however, rise in industrialization in Brazil and increase in government funding to provide better water technologies and energy-efficient desalination, especially in GCC, are expected to boost the market in these regions. These factors are driving the global wood activated carbon market. Key players profiled in the report include Cabot Corporation, Calgon Carbon Corporation, Carbon Activated Corporation, CarboTech AC GmbH, CECA SA, Donau Chemie AG, Fujian Zhixing Activated Carbon Co., Ltd., Ingevity Corporation, Kuraray Chemical Corporation Ltd., Osaka Gas Chemicals Co. Ltd., Oxbow Activated Carbon LLC, and Zhejiang Xingda Activated Carbon Co., Ltd. The top players (Kuraray Chemicals Co Ltd., Cabot Corporation, Ingevity Corporation, and Osaka Gas Chemicals Co. Ltd.) cumulatively accounted for more than 50% share of the market in 2017. These companies consistently engage in strategies, such as mergers & acquisitions, to expand their capacity and product portfolios. For instance, in 2018, Kuraray Chemicals Co Ltd. acquired Calgon Carbon Corporation, a leading player in the wood activated carbon market.